Coming up for air from writing the Synod History and to assure you I am still in the land of the living I share with you a report of the Rev. 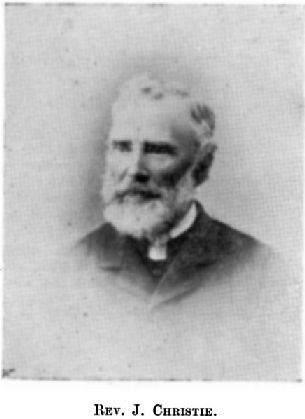 John Christie, Minister at Waikouaiti titled ‘Visit to Wellington 1881’. Christie was representing the Synod at the Northern Church General Assembly, mainly to participate in the Union discussions. His report gives an interesting insight into a Southerner’s ‘superior’ view of Northern happenings. As an anti Unionist the issues of instrumental music and the new law allowing the marriage to a deceased wife’s sister are noted with some cynicism. He briefly outlines his experience of worship and an opinion of the General Assembly debate on Union. Union of the Northern General Assembly and the Southern Synod of Otago and Southland took place twenty years later in 1901. “Biography, then, is a handshake across time, across disciplines, across genders, across whole ways of life. It is an act of friendship. It is a way of keeping the biographer’s notebook open on both sides of that endless question about the mysteriousness of life. What was this human life really like, and what does it mean to us now? In this sense, biography is not merely a mode of historical inquiry. It is an act of imaginative faith.” Biographer, Richard Holmes.